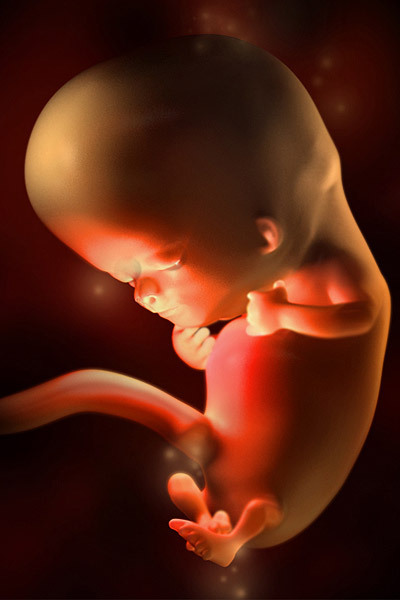 Learn what is happening with your baby's development in week 10. Plus, find out what to expect at your first ultrasound, and why you may be experiencing the pregnancy glow. Up until now your baby was classified as an embryo, but by the end of this week he will be a fetus and lots of changes are on the way. Paddle-like, or webbed, hands and feet will now separate into fingers and toes, bones will begin to harden and his kidneys are now producing urine. Most impressive? 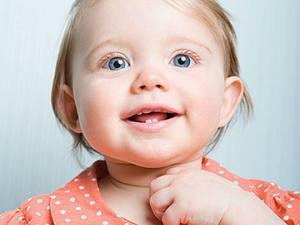 At this point your baby's brain is developing at astounding rates -- nearly 250,000 neurons are forming every minute! The end of the embryonic stage also marks a turning point for development dangers -- your baby is much less susceptible to them now. 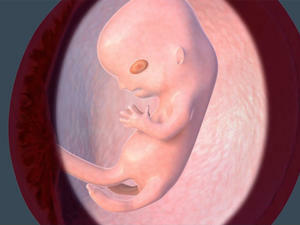 You'll notice in this image that your baby-to-be is looking more and more like a newborn. Her arms and legs are visible, and a recognizable profile can be seen. The bright white areas in the profile are facial bones. Loving your new dewy, pregnant glow? Thank the hormones HCG and progesterone (they increase the number of oil glands in your face, making your complexion shinier and smoother) and your boosted blood volume, which can make your skin slightly flushed and plump. And if the girls are giving you all kinds of nice cleavage these days, it's because estrogen and progesterone are spurring milk-producing glands to grow there (and there's plenty more of that to come)! You'll finally get a peek at your baby this week! Your upcoming prenatal visit will include your first ultrasound. 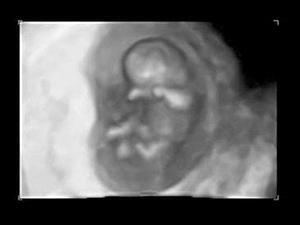 Your doctor will be able to point out fingers and toes, and you'll hear your baby's heartbeat. At this time, you may also need a nuchal translucency test, which can assess risks of Down syndrome, other chromosome abnormalities, and congenital heart problems. At 10 weeks, you've finally come to terms with your pregnancy. Now it's time to start thinking about spreading the word to your friends and family, if you haven't already (hands up if you Instagrammed your positive pregnancy test). Most people start sharing the big news around 12 weeks, but with a status update just a finger tap away, folks are starting to post their reveals even sooner. Whether you choose to speak out now or later, the trend seems to be to go big, bold and creative with your pregnancy reveal. And whether it's a Miley Cyrus parody or a sibling photo shoot, let's face it, it's a little about one­-upping your friends, right? Should my partner come with me to my medical appointments? There's no way to know for sure, but you can make an educated guess--here, genetics experts show you how. Your baby is growing so fast! Find out the major changes happening when your pregnancy has hit ten weeks. Find out what's going on in week 10 of your pregnancy on this podcast episode of Pregnancy Confidential.